Few buildings in the world can claim to have been in constant use for more than 900 years, but the UNESCO World Heritage Site of Durham Castle is one of them. It was originally built in the 11th century (opposite Durham Cathedral), to protect the bishop from 'barbaric northern tribes' in the wake of the Norman Conquest of 1066. Over the centuries the core of the ancient castle remained intact, but there have been numerous renovations and extensions. The castle's aspect today is imposing. The Great Hall is one of the largest in Britain, created by Bishop Antony Bek in the 14th century. 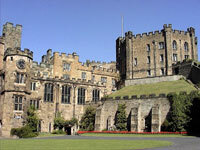 Since 1840, when the bishop moved elsewhere, it has housed a college of Durham University. Visitors are welcome to a guided tour, lasting about 45 minutes.